This introduction to the "Didache" provides a guide to this important early Christian text, including a new translation and a commentary. - Publisher The Didache (or The Teaching of the Twelve Apostles) is one of the earliest Christian writings, compiled between 50 and 70 CE. Thus, it probably predates the four Gospels. It offers a unique glimpse into how some of the earliest Christian communities lived and worshiped. This accessible volume offers an introductory guide to this important text, including a new translation and a commentary highlighting areas of interest to Christians today. It is an essential resource for readers interested in history, Scripture, and liturgy in Christianity's earliest period. 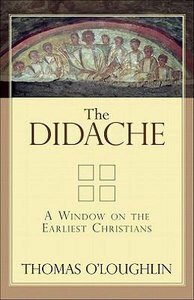 About "The Didache: A Window on the Earliest Christians"
The Didache (or The Teaching of the Twelve Apostles) is one of the earliest Christian writings, compiled between 50 and 70 CE. Thus, it probably predates the four Gospels. It offers a unique glimpse into how some of the earliest Christian communities lived and worshiped.